Extreme monetary accommodation and share buybacks have extended the last three economic expansion cycles since 1991, but magnified savings and investment deficits through the economy at the same time. The best course is for individuals to proactively control and limit risk exposure before loss cycles hit so that we don't lose money and have liquid cash to buy investment assets once they retrace to good value. At that point income yields are two and three times higher than those collected near cycle-highs, and we don't waste years just trying to make back losses. Extreme monetary accommodation and share buybacks have extended the last three economic expansion cycles since 1991, but magnified savings and investment deficits through the economy at the same time. 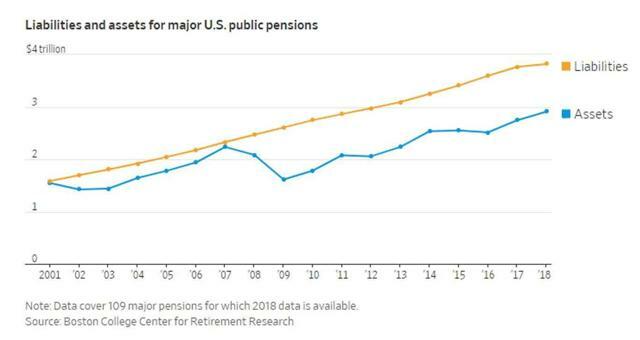 For one important example see WSJ: Long Bull Market has failed to fix Public Pensions. 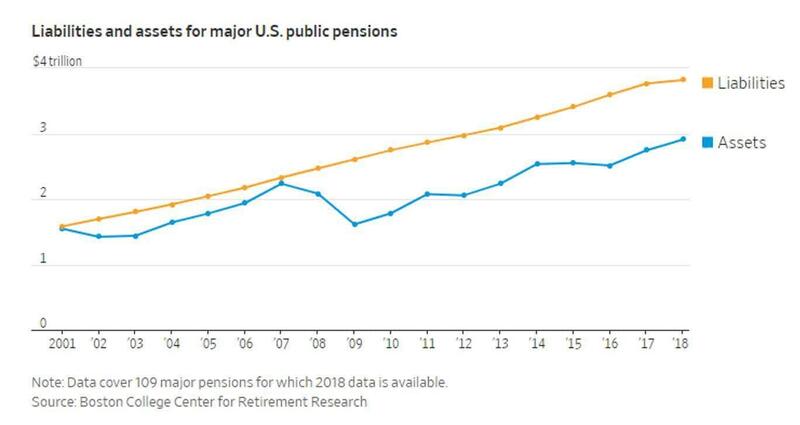 Pension liabilities (in yellow below) have compounded faster than assets (in blue) over the last 20 years, while contributing workers have stagnated and the number of retirees looking to withdraw has doubled. The first thing you have to do is make up what you lost, and it takes years. And then you have to make up what you didn't earn on what you didn't have. It's a pretty steep climb." The best course is for individuals to proactively control and limit risk exposure before loss cycles hit so that we don't lose money and have liquid cash to buy investment assets once they retrace to good value. At that point income yields are two and three times higher than those collected near cycle-highs, and we don't waste years just trying to make back losses.